WHITE HOUSE — The big-play Blue Devils were back in business Friday night with a 41-14 thumping of Creek Wood to clinch a postseason berth for the first time since 2014. The hosts rolled to 390 yards of total offense, including scoring plays of 54, 36 and 41 yards, before a 75-yard passing strike set up a short touchdown in the fourth quarter. 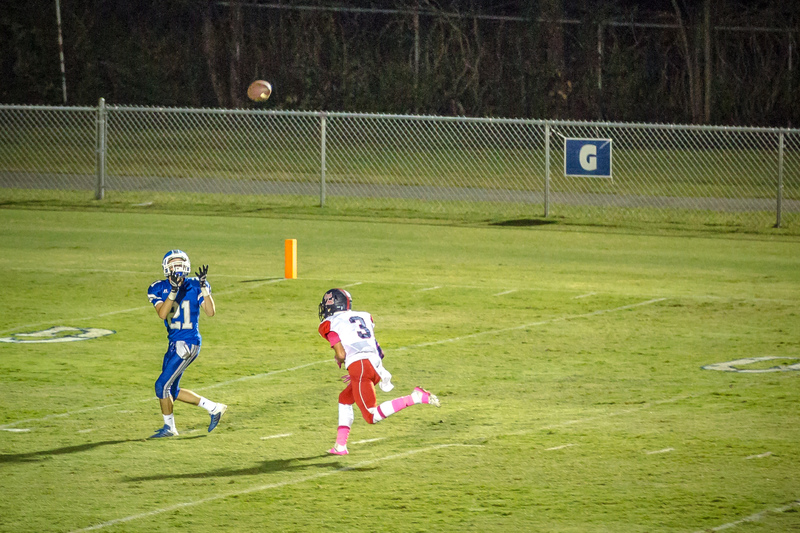 Andrew Nixon’s pass to Brett Drake was the longest offensive play of the year. White House (8-0, 4-0) remained perched atop Region 5-4A with four second-half touchdowns to build on a 14-0 halftime lead. The last meeting between the schools was 2014 when the Devils won a first-round playoff game over the Red Hawks. 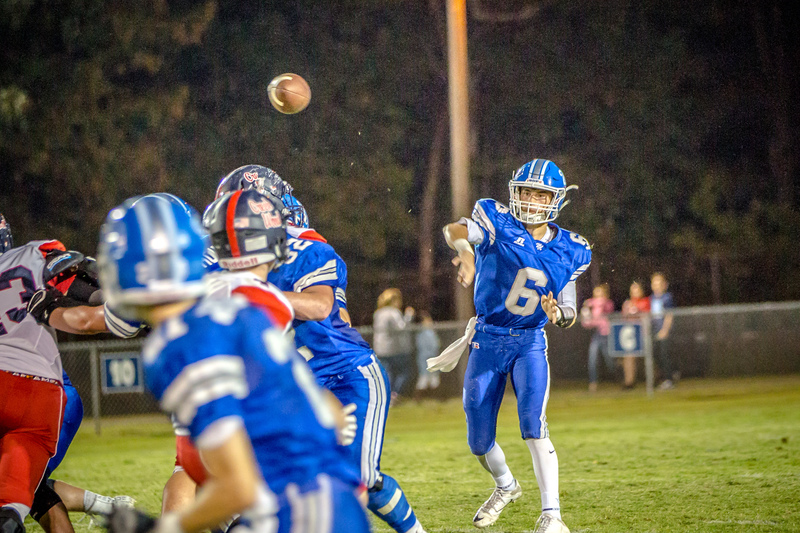 Nixon completed 6-of-10 passes for 176 yards and a 36-yard touchdown pass to Kevin James, while his junior backfield mate Preston Sharber rushed 13 times for 115 yards and two touchdowns including a 41-yard score. Sophomore Wil Blackburn scored on a big burst for the second week in a row, topping last week’s 39-yarder with a 54-yard sprint in the second quarter. He rushed nine times for 80 yards. Drake caught three passes for 102 yards, while Miller Lowe caught two for 38, including a 36-yard reception. 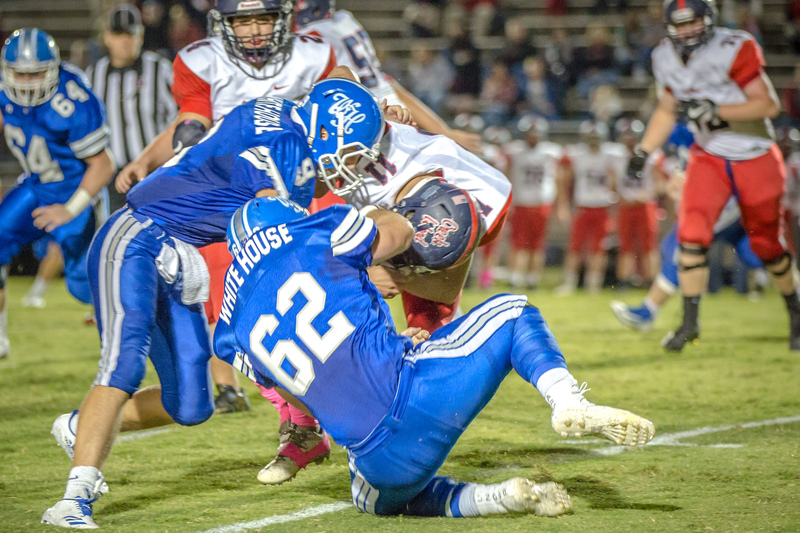 While the White House offense and special teams has been explosive with big plays from the start of the year, the defense remained tight and held Creek Wood to single digits until the final drive of the game. Drake had 13 tackles, followed by senior defensive end Tyler McMurtry with 12 tackles, three tackles for losses and a sack, while Colby Taylor had 10 tackles, Eddy Walker nine and Sharber and Josh Dailey eight. 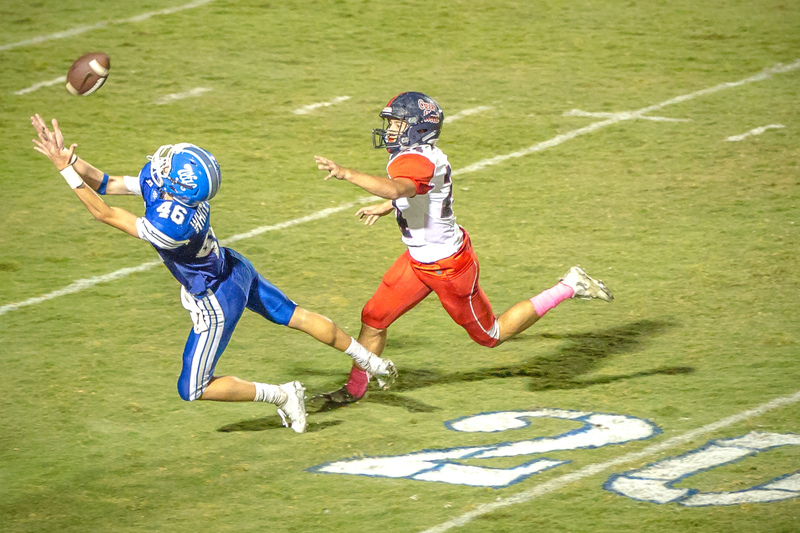 The Blue Devils forced just one turnover, but held the Red Hawks to 4-of-11 on third down and 0-of-2 on fourth down. McMurtry blew up a fake punt when Garrett Dolinich shuffled a pass to Mitch Duke for a loss of 10 yards. Avery O’Bryan recovered a fumble caused by Carter Hunt and Brett Drake. Creek Wood had 235 yards of total offense and was only the third team in eight games to score double digits against White House, who has surrendered just 64 points all season. 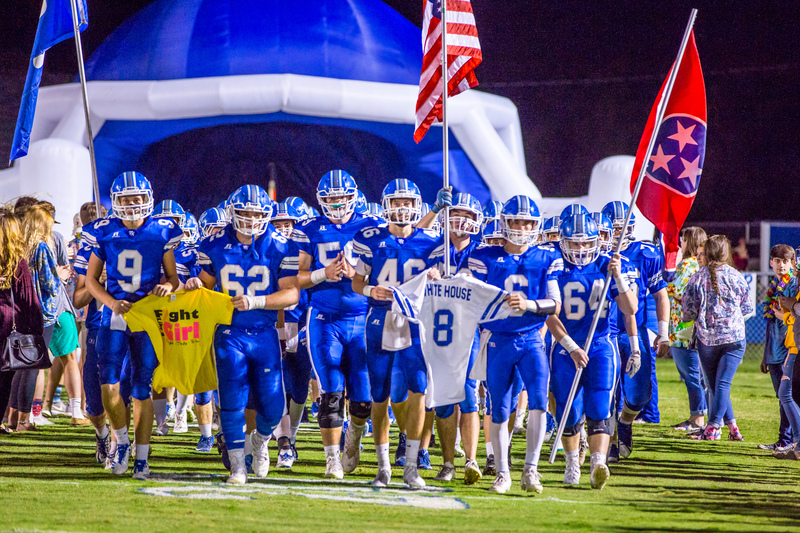 The Blue Devils are ranked fourth, state-wide in all classifications, at just 8.0 points allowed per game. The best in school history are the 1985 and 1989 Blue Devils who allowed seven points per game. 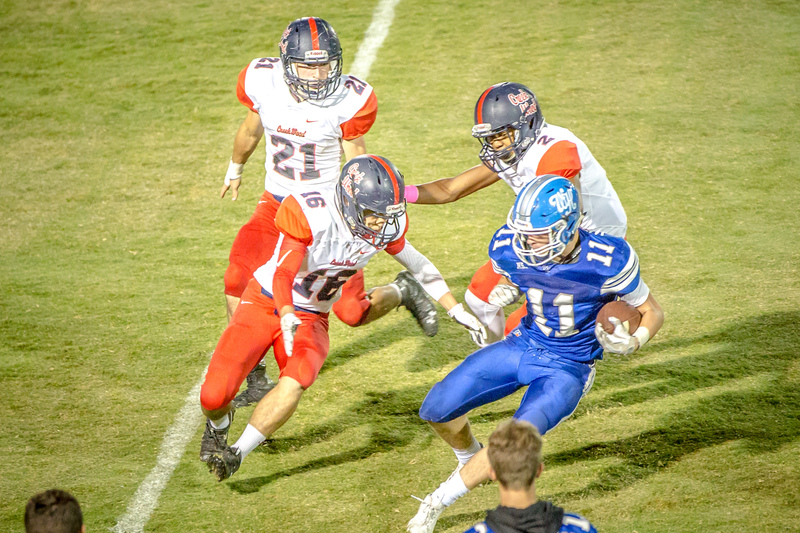 White House drove nine plays and 78 yards on the opening series when Sharber scored from two yards out and Jacob Harper hit the extra point for a 7-0 lead. Forcing a second punt of the game, White House took over at its own 46 and Blackburn exploded to the endzone for the 14-0 edge that remained until intermission. Nixon hit James in stride in the middle of the endzone in the third quarter for 36, but Creek Wood narrowed the gap to 21-7 when Timothy Randolph scrambled for 31 yards. 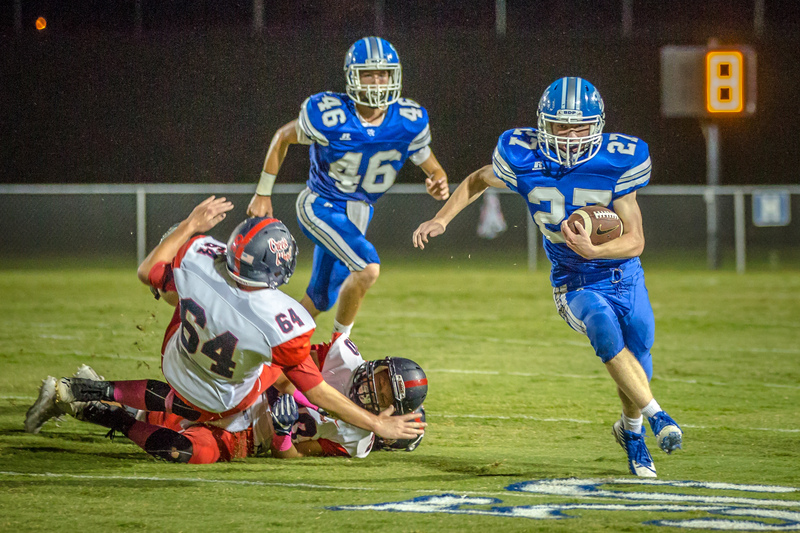 Sharber scored from 41 out, but the Devils missed a two-point conversion for a 27-7 edge, then Miller Lowe scored his first rushing touchdown of the year with a one-yard run with Harper’s kick making it 34-7. Drake caught the 75-yard pass down the home sideline in the fourth but was forced out of bounds at the two, and Ezra Bates scored his first career touchdown with a two-yard plunge. Corey Curtis added the final PAT of the night for a 41-7 lead. With Duke now at quarterback, the Red Hawks drove nine plays and 70 yards against the White House second team defense and scored with under a minute to go on Duke’s five-yard dive to the right corner. 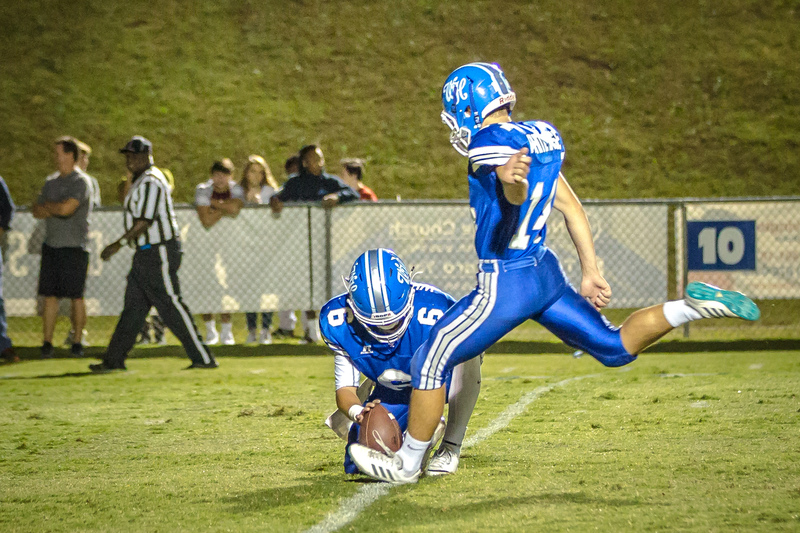 Javon Sweatt nailed his second extra point for the 41-14 final. The teams combined for 13 penalties for 147 yards. Creek Wood fell to 4-4 (1-3) and travels to Portland in week 10 for a crucial matchup for the fourth spot in the region. With four teams going to the playoffs, the Red Hawks remain in a three-way battle with Portland and Montgomery Central for the last spot. A three-way tie is possible, and with a win over Portland, Creek Wood could hold the overall record tiebreaker over the Indians and the Panthers if all three teams finish 2-4. For White House, the road is much different. The Devils are in the playoffs. 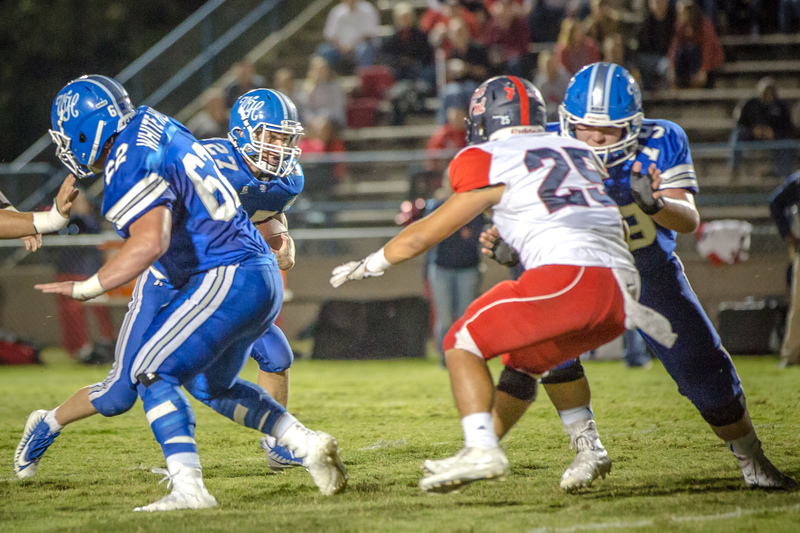 A win over Montgomery Central guarantees a home playoff game in the opening round. A win over Montgomery Central and Greenbrier means a region championship. “Next week will be a special night for our seniors (final regular season home game) and for this football team, and we have to do our job as a team and be prepared and ready to play,” Porter said. “We just have to take this one week at a time and realize what’s in front of us, and our responsibility is to get to the practice field on Monday and concentrate on Montgomery Central next Friday night.